Local officials are trying to stop Shell’s Arctic oil-drilling fleet from docking at Seattle’s harbor for the summer, saying that current arrangements go against the port terminal’s land-use permit. Shell has multiple ships and oil rigs en route. Seattle Mayor Ed Murray said the current contract between the Port of Seattle and a company representing Royal Dutch Shell PLC violates the land-use permit for the port’s Terminal 5, and that the Port would have to apply for a new permit. “After reviewing the 20-year-old permit for the operation of the cargo terminal, [Seattle’s Department of Planning and Development] has found and I concur that the long-term moorage and maintenance of Arctic drilling equipment falls outside the current permit,” the mayor said Monday morning at a fundraising breakfast for Climate Solutions, a self-described “clean-energy economy” nonprofit. “I expect the Port to obtain all required city permits before any moorage or work begins at Terminal 5 on Shell’s oil and drilling equipment,” he added. 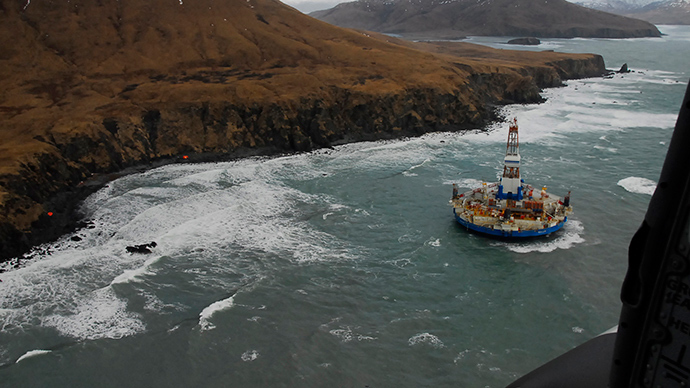 Shell was planning to base its fleet of polar oil exploration vessels in Seattle for six months each year when they were not being used in the Arctic. Foss Maritime, the company’s Seattle-based contractor, said that basing the drilling fleet at the terminal would be no different than the normal handling of shipping containers. While requiring the new permit would not immediately halt the port’s plans, it has created a chance to reconsider the arrangement and be more environmentally friendly, Murray said. “This is an opportunity, I believe, for the Port and all of us to make a bold statement about how oil companies contribute to climate change, oil spills and other environmental disasters and reject this short-term lease,” he said. Paul Queary, a spokesman for Foss Maritime, said the company was moving ahead with the plans to host Shell’s fleet, having already paid the Port of Seattle $3 million for the lease of Terminal 5 and employed hundreds of people on the site for months. Two oil rigs are currently on their way to Seattle: the Noble Discoverer headed for the city under its own power, and the 400-foot-long Polar Pioneer currently at the port of Los Angeles. The icebreaker, Aiviq, is already at the terminal, as well as the 392-foot cargo ship, Harvey Supporter, which about 40 dockworkers have been loading. “It’s extremely disappointing that city officials are starting to determine which cargoes are going to be handled in port operations,” Cam Williams, president of International Longshore and Warehouse Union, Local 19, told the Puget Sound Business Journal. Mayor Murray, however, makes no secret of his desire to keep the oil fleet far away from Seattle. Murray’s position drew praise from environmental groups and activists opposed to Arctic drilling, reported the Seattle Times. “We hope the Port will do the right thing and use this as the rationale for rescinding the lease,” said Emily Johnston of 350 Seattle, part of the “Shell No!” coalition.